ASO is a vertical scrolling shooter arcade game developed by SNK in 1985. ASO stands for Armored Scrum Object, and the game is known as Alpha Mission outside of Japan. It was later ported to the Famicom in 1986. The game spawned a more successful sequel in 1991, Alpha Mission II for the Neo Geo platform. 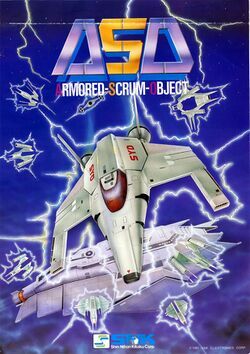 ASO is very similar to Xevious; a scrolling shooter with segregated weapons. Missiles are used to destroy ground enemies, while laser-like weapons are used for aerial opponents. Throughout each of the levels, the player must fight off waves of enemies that threaten several space stations. A battle against a boss takes place at the end of each stage. The player's craft can be upgraded by collecting power-ups, as well as by collecting pieces of armor which can only be activated when the player collects enough energy. This page was last edited on 12 March 2008, at 20:49. This page has been accessed 18,770 times.